Making an exhibition of myself..
My first finished watercolour (I painted it once before but the perspective was all wrong because I was so keen to get started painting that the initial drawing was a bit of a rush!). Not a masterpiece, but happy with it as a beginner's job. Re: Making an exhibition of myself..
That's beautiful, Tina - I so wish I could paint. Has a lovely atmospheric quality to it. Well done! its lovely tina . be proud of it. Be happy to hang that on my wall, well done you. Ist attempt brilliant, super colours. Cor! That's absolutely smashing, Tina. Well done you, girl. Di Masters wrote: Be happy to hang that on my wall, well done you. Apparently that would cost you £45; Maddy's suggested price for it. lol. Sounds like a bargain to me, how much did it cost for the framing? 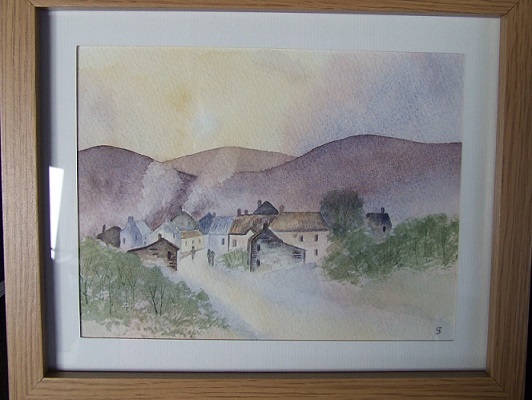 I paid £42 about 10 yrs ago for a small painting that took my fancy. thriftycrafter wrote: Sounds like a bargain to me, how much did it cost for the framing? What a lovely picture, wow whats your next lot going to be like. Thanks Billie. Working on a rose at the moment. Ideally I'd like to paint Dawns wedding flowers from last week well enough to be able to give a picture for her first anniversary, so I have a year! Aw, what a beautiful idea,. £4 Wilko bargain there, looks like a bloomin good job. Wow, well done and yes be proud of it, it's Fab.